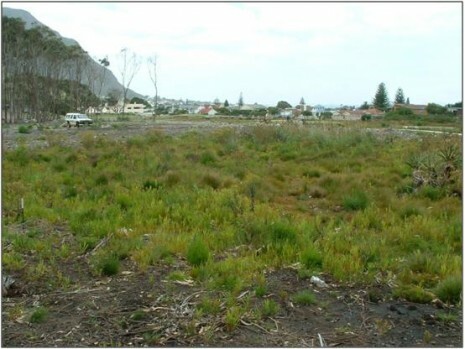 Twenty years ago a group of golfers decided to take on the challenge to restore the wetlands within Hermanus Golf Club to a more natural state. 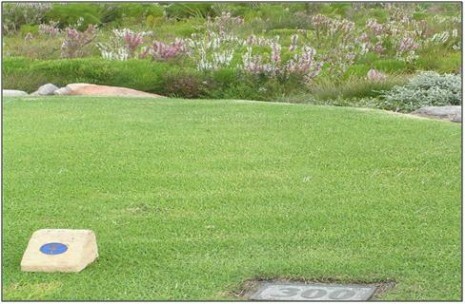 The aim was to enhance the Golf course with its natural beauty. By restoring the wetland, local and international golfers and their visitors could enjoy their games amidst the visual magnificence of the greens and browns of the fine-leaved Fynbos flora, enhanced by delicate splashes of colour from a variety of ericas sedges and proteas, accompanied by the sounds of the clicking stream frogs and colorful endemic birds darting in between the bushes. These early efforts saw the reappearance of a sizeable portion of wetland alongside the present-day 27th from what had been an impenetrable pine and gum forest. Wetlands have been identified as the third most important life support system on earth. In addition to being important habitats for many species of birds, amphibians, fish, invertebrates and wetland-associated mammals, such as otters, mongooses and small buck, they also perform invaluable functions in maintaining healthy ecosystems by modulating water quality and attenuating floods. Dense restios dominate the space between the T-off and the fairway at the 15th hole, hiding place for many a miss-hit ball. Wetland plants absorb nutrients from the surrounding water, acting as nutrient ‘sponges’ and assist in the removal of excess nutrients from the water. The slow passage of water through wetlands means that they play an important role in flow regulation, reducing the rate at which rainfall accumulates in lower-lying areas and reducing the erosive power of surface runoff. The roots of wetland plants are excellent binders of the soil, and thus reduce bank erosion. Wetland soils retain water for long periods of time, contributing towards the perenniality of water supply. However, despite the ecological, economic and educational value of wetlands, it has been estimated that over half of South Africa’s wetlands have already been destroyed and lost, while those that remain are among South Africa’s most threatened natural areas. South Africa is a signatory to the Ramsar Convention, an international treaty aimed at the conservation of wetland habitats. This convention binds members to a set of criteria aimed at the conservation of wetland ecosystems. The criteria include: stemming the loss of wetlands, promoting the wise use of all wetland areas and promoting the special protection of listed wetlands. The Hermanus, Kleinmond, Betty’s Bay coastline is characterised by a raised sandstone bedrock shelf between the sea-bed and the inland mountains, resulting from the upward tilt of the coastal margins and lowering of sea levels during recent geological time. Along the band where the mountain slopes meet the underlying bedrock (covered with windblown sands and coarser colluvial material eroded from the mountain slopes), groundwater is forced to the surface in places, creating coastal-shelf marshes. 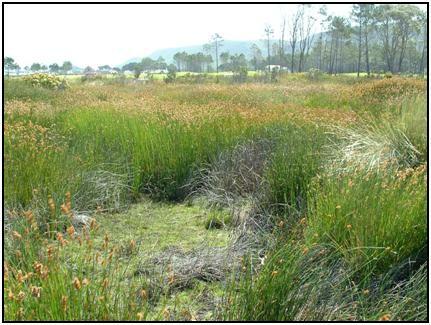 These marshes are important habitats, characterised by unique fynbos wetland plant communities, and supporting numerous animals such as insects, frogs, otters, and small buck. Along this coastline such coastal-shelf marshes are a common natural feature, but highly threatened because of increasing urban development along the narrow band between the sea and the mountain ranges. Conservation of the biodiversity treasures that give the Overstrand area its unique status as the jewel in the Cape Floral Kingdom is nowhere so challenging as when urban land is developed. The Hermanus Golf Course is located precisely along this coastal band. Prior to the establishment of the golf course, this area almost certainly comprised extensive wetlands, only remnants of which remain today, whilst much of the emergent groundwater is captured in cutoff drains along the upper boundary of the course, and channeled through the grounds via a series of open earth drains. Between 2004 and 2006 the golf club was extensively redeveloped, as the Fernkloof Estate, to expand the golfing facilities and establish residential development on adjacent previously undeveloped land forming a longitudinal corridor between the coast and the Kleinrivier Mountains. Given the few coast–to-mountain links between the Onrus River and Kleinrivier, a key challenge for urban conservation in the Hermanus area is the maintenance of such ecological corridors of natural vegetation, allowing for the presence and migration of biota. 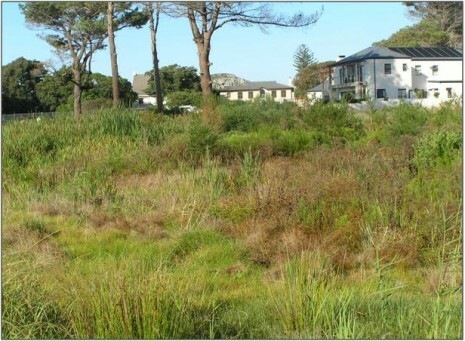 The primacy of ensuring ecological corridors through the site and of conserving existing remnant wetlands was the guiding design principle in the layout of residential areas and golfing greens. The area designated for formal conservation of wetlands on the site has been increased by some 30% over and above that required for approval of the development by the authorities, through a programme of weeding of alien species and some earthworks to remove fill and re-shape degraded wetlands. A total of 11 ha of wetland is now formally conserved in the “no-go” areas of the estate and golf course. Careful management of irrigation and drainage through the golf course ensures that the water levels in the wetlands are not altered from what is needed to maintain their natural character, a major achievement for this type of development, where adequate drainage from the fairways must not be at the expense of wetland health. 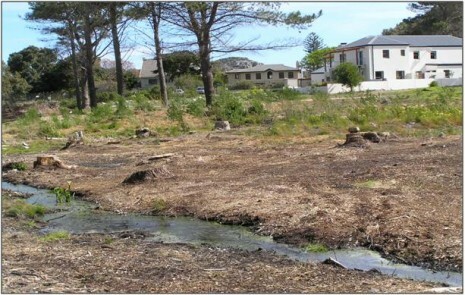 The progressive eradication of alien trees over the whole of the Fernkloof Estate and Hermanus Golf Course and replacement with indigenous species is contributing to the establishment of more natural, indigenous terrestrial corridors that link the wetland areas and extend to the Kleinrivier Mountains beyond the urban edge. Scientifically-based monitoring is implemented to provide accurate feedback to guide management decisions. A Wetlands Committee with representatives from all stakeholders has been highly successful in ensuring good communication, collective and co-operative decision-making and appropriate resourcing of the programme. The remarkable achievement of the project is not only the fact that wetland habitats are being expanded and managed, but that this is done in the context of an urban environment. Here wetlands and terrestrial corridors of high biodiversity value abut directly onto residential areas and golfing greens and fairways. Sustainability of the project is ensured not only by the enshrined funding mechanism, but by way in which the success of the efforts have created increasing levels of support among residents and golfers for the idea of maximising the natural value of our course. TOP: Pioneer wetland vegetation after felling of gum plantation adjacent to established wetland conservation area north of the 15th fairway (2007). BOTTOM: Expansion of wetland into previous plantation areas (2012). TOP: Removal pine forest and alien shrub understorey below housing Precinct 2 / top of the 27th fairway (2008). The weeding of alien species from the wetland conservation areas is of course a vital component of the alien plant control programme, where their presence is associated with desiccation and shrinkage of the wetland areas, as they consume substantially greater volumes of water, especially during summer months, than do indigenous trees. The continued presence of aliens remains a source of seed for infestation of conservation areas. Few corridors of natural vegetation between the coast and the mountain kloofs remain along the stretch of road between the Onrus River and the Klein River. The Golf Course provides one of the very few significant potential corridors. The presence of indigenous plants in these corridors greatly enhances their value – as refugia, as food and nest or shelter materials. Greater levels of indigenous species will result in greater animal diversity, and better ecological functioning within the environment extending beyond the boundaries of the estate. 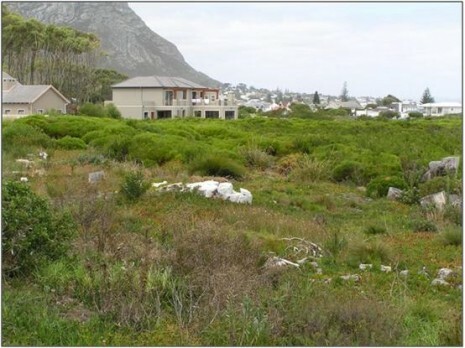 The beneficial effect of natural vegetation corridors to the animal life inhabiting them – pollinators, grazers, predators both big and small – is enhanced in an environment like the Hermanus Golf Course where a range of wetland types are interlinked with terrestrial areas. Many insects in particular require aquatic environments for their early development, but their adult life is spent in a terrestrial setting. It was for these reasons that stringent controls are written into the title deeds relating to the plants that may be cultivated in private gardens and that such effort was exerted in the landscaping contract to focus on indigenous plants. And for these reasons that the replacement programme must continue alongside alien eradication. Removal of the pine / gum forests provides an opportunity to increase plant diversity, provide habitat for indigenous fauna of many forms, and enhance aesthetic appeal of forest and thicket areas on the golf course. Indigenous planting does not mean that the forested areas that have been a characteristic of the golf course need be a thing of the past. Rooiels, ironwood, stinkwood, white pear, Cape saffron, African holly, Cape beech – and other giants of the Afromontane forests, with heights of 10 – 30 m – are all recorded within the Overstrand and Hermanus area and suitable substitutes for gum and pine. Refugium for shy animals can be provided by smaller, thicket-forming shrubs and small trees, including the Tree fuchsia, the Water-blossom pea (which has started seeding in the Flat Street area and will soon be displaying its showy lilac blooms), Camphor bush, wild current…. the possibilities are enticing indeed. Wetlands need to be managed with an appropriate fire regime. Without this, the constituent species can become moribund – woody and unproductive. Species which reproduce by seeding (as opposed to sprouting) tend to produce less and less seed, which threatens their continued existence in the stands. Seed germination in fynbos generally benefits from fires, and a typical fire interval between fires would be 12 – 15 years as the build-up of dead standing litter and thus fuel increases fire probability. Re-seeder species generally senesce and graminoid and Typha swards require removal of dead standing litter (either by grazing or fire) in order to keep producing fresh annual growth. Some of the wetland areas were burnt in 2006, namely the Fairways Avenue Wetland A, but the fire was “cool” and did not extend into the bush clump areas. A fire management plan, including a set of steps and precautions to facilitate controlled burning of the wetland conservation areas is presently being developed by the Wetlands Committee. Erica capillaris was last seen in Hermanus in Arc Street 40 years ago, and was thought to be locally extinct. This species inhabits the damp seasonal wetland fringes of the Flat Street wetland area. Another species of local importance in Flat Street is Erica villosa, which has a restricted distribution. It was previously believed to be endemic (restricted) to the Hermanus mountains, but has also been recorded from the Cape Peninsula. A striking feature of the early surveys of the Hermanus Golf Course wetlands was the absence of the marsh daisy, Osmitopsis astericoides. This species is one of the dominant plants typical of the Overstrand coastal wetlands, (others being restias, Erica perspicua and Berzerlia lanuginosa). Only two specimens of marsh daisy were found in the first surveys, and these have since disappeared. We expect to see this plant re-establish as the wetland areas mature – after their recent history of alien invasion, annual mowing etc – so watch out for this one!